This was our first time dining at Mama Melrose. 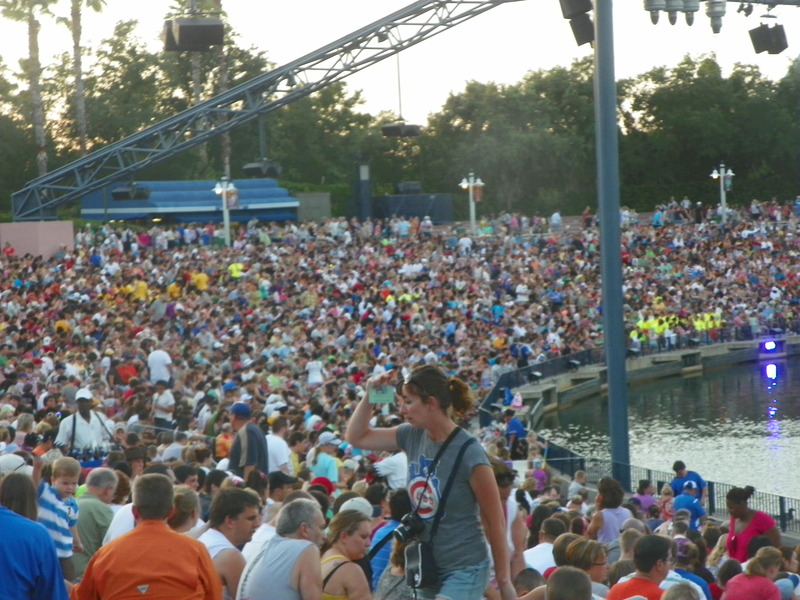 We decided to try it to take advantage of the Fantasmic! show package. With lunch (and early dinner) you can get a Fantasmic! reserved seating ticket if you make your advanced dining reservation (ADR) by calling Walt Disney World dining and asking specifically for the Fantasmic! dining package or booking it through My Disney Experience.com. There was a mix-up in our reservation, they had a party of 4 not 7, but I do have to say the hostess handled it very well and although our party of 7 was seated at two tables we were seated within 15 minutes of our ADR time. Your pre-fixe meal consists of an appetizer, an entrée, a dessert, a beverage (soda, milk or juice) for each member of your dining party. 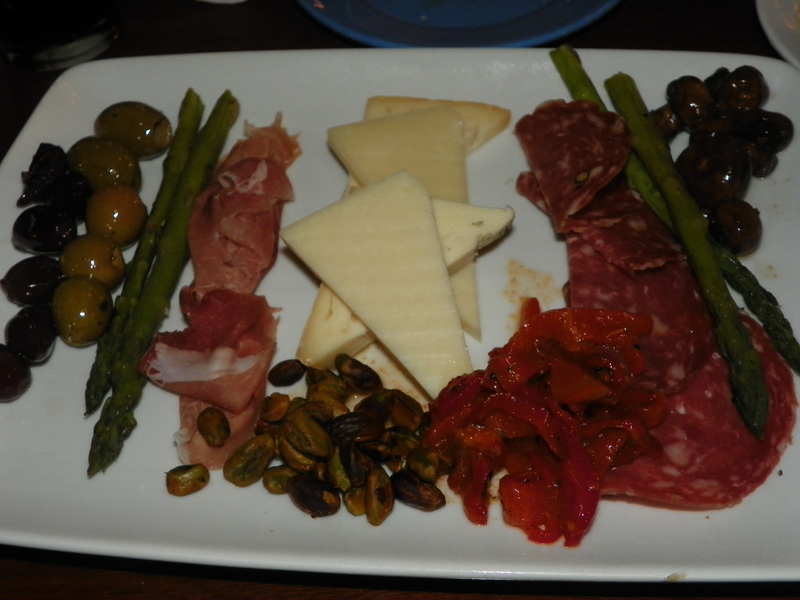 We ordered the Mama Antipasto platter (pictured above) for 2 to split. It was very good. The grilled asparagus were served ice cold and we were not expecting that but they were crisp and delicious. 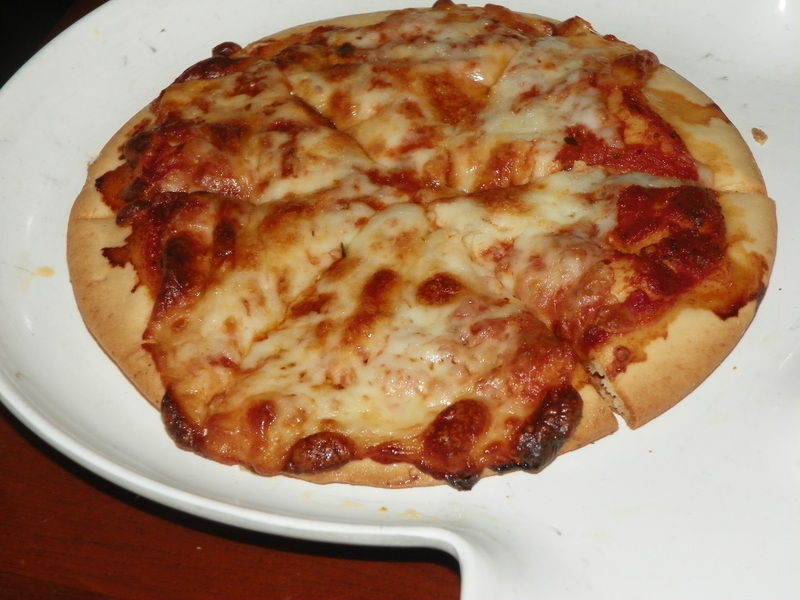 The pistachios and the red pepper strips were a hit as were the salami and sharp provolone. My son is gluten-free and cannot eat any foods with food coloring so the chef came out to talk to us at this time and helped my son order something for lunch. He chose a green salad with no salad dressing, an Amy’s gluten-free pizza and the chef promised my son that he would create a special dessert just for him because he could not have their signature spaghetti and meatball cupcake. My daughter is 11 years-old and now orders from the adult menu. 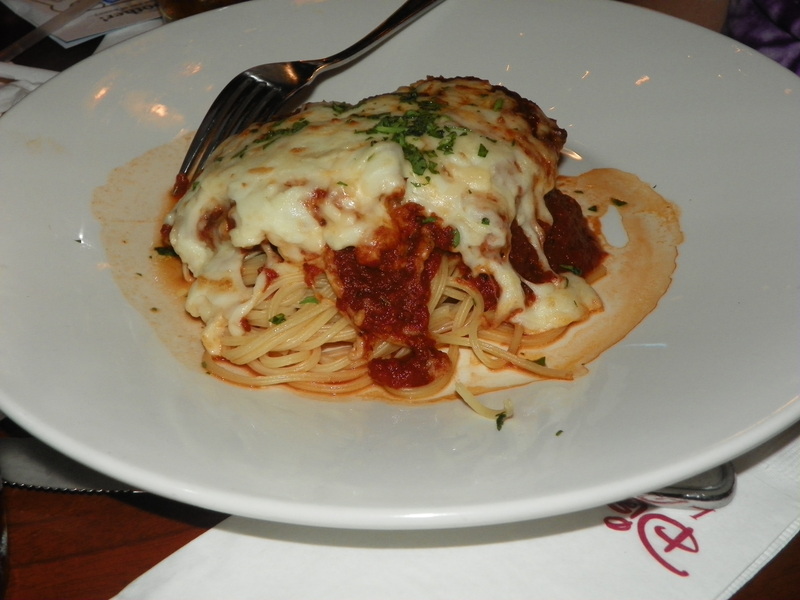 She chose the Chicken Parmigiano with spaghetti. She enjoyed her meal and mentioned that her favorite part was that it was a real chicken breast but that had not been flattened so much that all she could taste was breading. She thought the portion looked small when it arrived but in the end she only ate the chicken and a bite or two of the pasta. For my entrée I chose the Penne alla Vodka. I had eaten steak twice already during this trip and was planning on having it at least one more night so I thought a pasta entrée would be perfect. The pasta was perfectly cooked the sauce had a nice salty bite to it from the pancetta but it just seemed somehow ordinary. 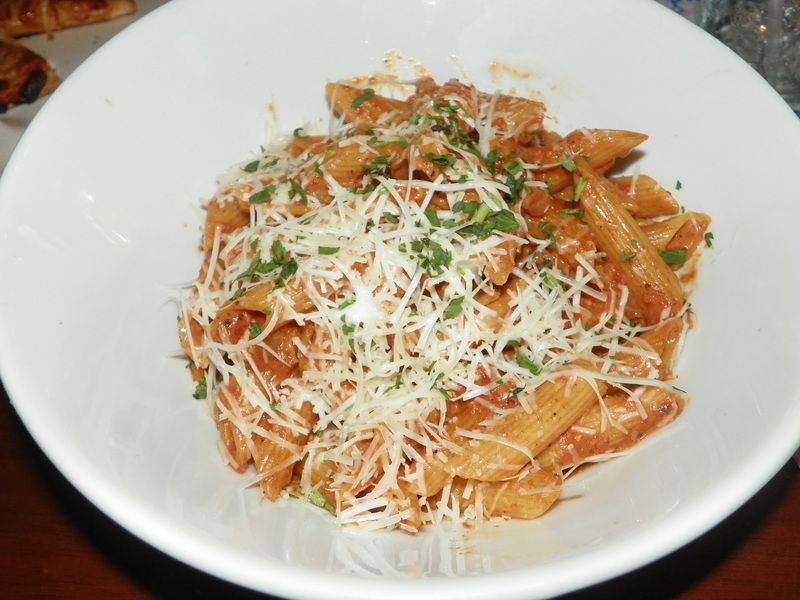 We have great Italian restaurants in our area and I thought it was a dish that I could easily have ordered from a dozen restaurants and it would be just as good if not better than this dish. This picture does not do this dish justice. It was the hit of the entire trip. The plate looked messy when it arrived but the steak was cooked medium as was requested and was so moist and flavorful I ended up trading plates with my partner half way through dinner. The charred strip steak with Italian roasted potatoes and cipollini onions, aged balsamic-shallot butter, and Chianti wine reduction was amazing. 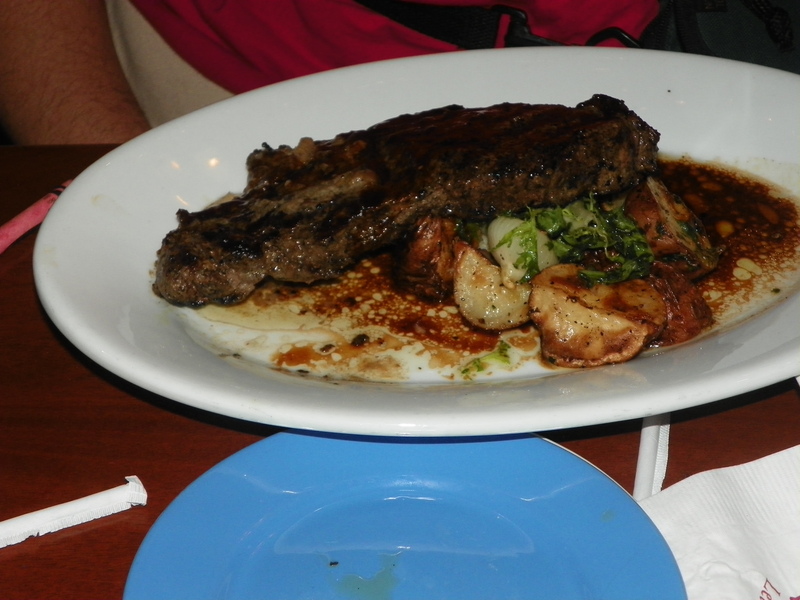 Yes, there were only 3 potato wedges and 2 onion pieces on the plate but the steak was melt-in-you mouth wonderful! The balsamic-shallot butter made all the difference in making an ordinary cut of meat extraordinary. Again, the chef went above and beyond in his service to my son. 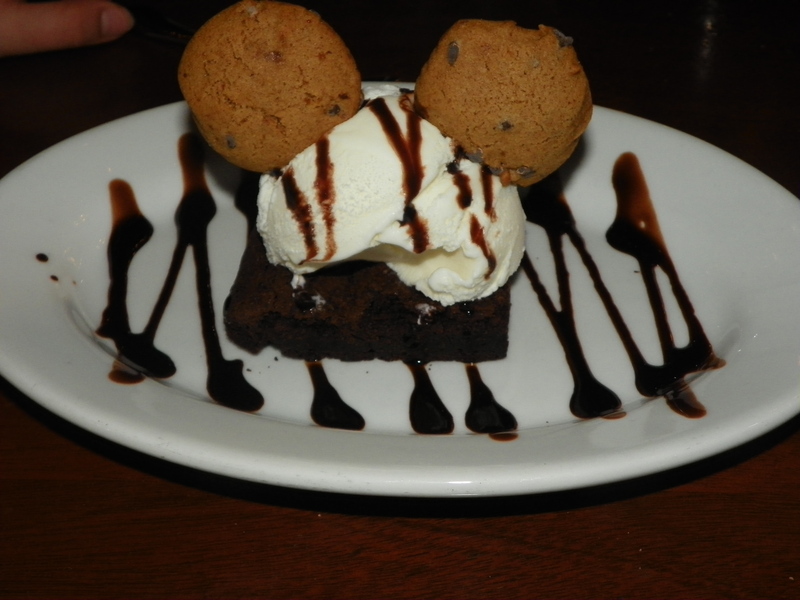 He made him a Mickey Mouse brownie sundae with a gluten-free brownie, chocolate drizzle and gluten-free chocolate chip cookie ears. My son totally forgot that he could not have the wonderful cupcake he saw all the other children eating and felt incredibly lucky and special because he had the only Mickey Mouse dessert. My cheesecake dessert was light and luscious. It had a slight chocolate almond flavoring that was not overpowering. 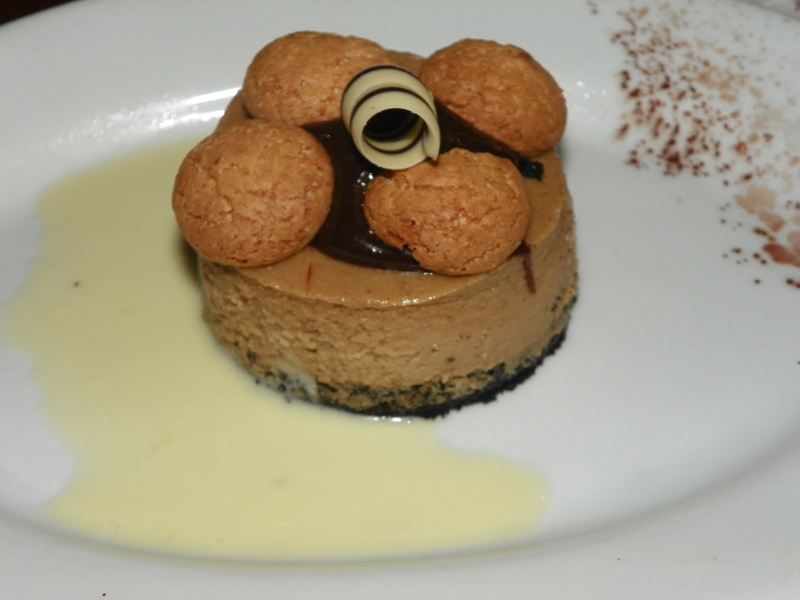 The cookies on top of the cheesecake were fresh and not stale or mushy from having sat out too long. It was a delightful end to my meal. 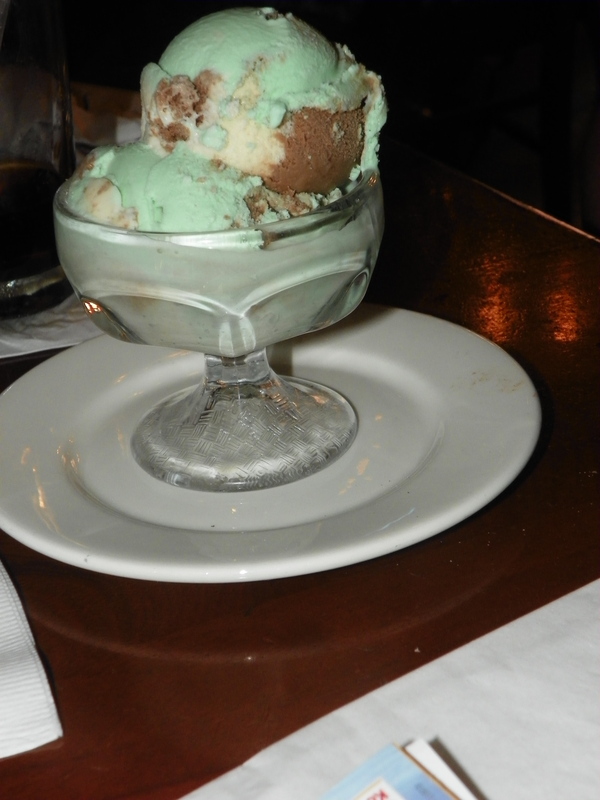 My daughter decided on the spumoni gelato to end her meal. She was not sure if she would like the pistachio gelato even though she loves pistachios. She enjoyed her dessert very much even though she could only finish about half of the dish. 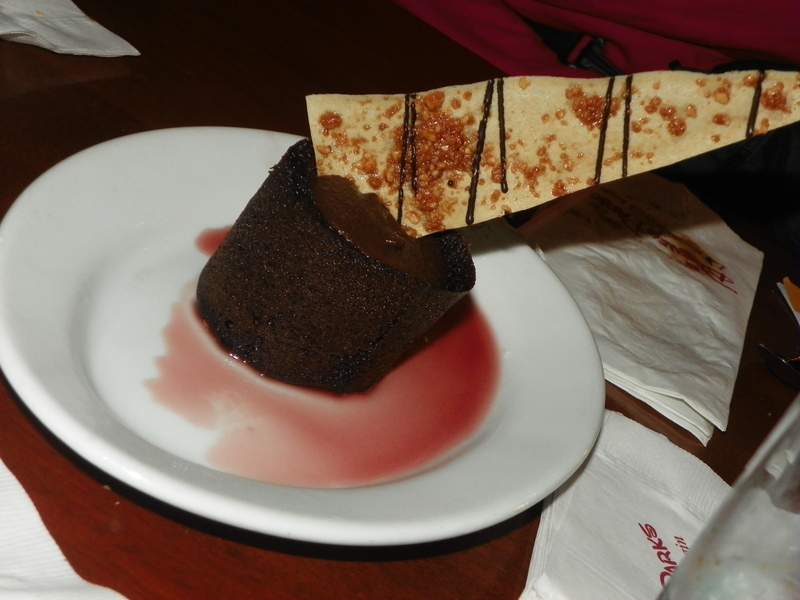 The chocolate cannoli cake with a Chianti red wine sauce was moist and chocolatey. The Nutella in the center with the cannoli filling was a surprisingly delicious surprise. Over half of the dessert was left as it was just a bit too heavy after all the other food we had eaten. My daughter loved eating the cannoli strip drizzled with chocolate. At the end of our meal we were given our Fantasmic! ticket. We were so very glad we had done the package meal as when we arrived at Fantasmic! one hour before the show they were beginning announcements that the general seating portion of the theater was reaching capacity and anyone who left would not be guaranteed that they would be allowed back in. The seating for the package tickets is all the way to the right of the arena but we had not problem with the view during the entire show. The dinner package is the only way I’ll do Fantasmic. I’m so glad they offer this. I really like Mama Melrose. We’ve been there quite a few times and my experience has been much like yours. Occasionally an entree isn’t fantastic, but we’ve not had anything awful ever. Most of the time it’s very good. The bread plate appetizer was incredible (no longer on the menu)…but that’s from back in my gluten period. Like your son, I’d have to skip that now, so it’s good to know that they are gluten-free friendly there!! My kids loved "Honey I Shrunk the Kids" play area. We went at uncrowded times and they could get their energy out. What is one thing you miss from DHS?